"This is an adaptation of a friend's recipe. 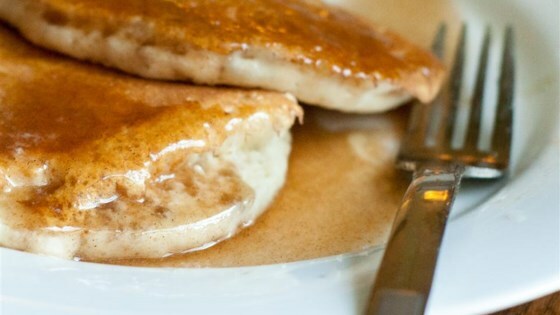 My kids go crazy over this syrup when we have pancakes or waffles. It's also good on apple slices or strawberries. The only problem is that my kids always forget their manners and lick the leftover syrup off their plates." Stir together the white sugar, brown sugar, flour, and cinnamon in a small saucepan. Stir in vanilla extract and water. Bring to a rolling boil, stirring often. Continue to boil and stir until mixture thickens to syrup consistency. Remove from heat; cool 10 minutes before serving. this recipe was great :) I used all brown sugar to make it darker. Not too cinnamon-y, just right.